Jean-Jacques de Morgan was born in Huisseau-sir-Cosson, in the French department of Loir-et-Cher, on June 3, 1857. The family environment was prone to learning and scientific rigor. His father was a mine engineer who was interested in prehistory, and who initiated his two sons in fieldwork. The younger, Jacques, wanted to follow his father’s profession. He started to publish the results of his research in 1879, and meanwhile, he graduated from the Ecole des Mines in 1882. The scientific reports that Jacques de Morgan wrote upon his return from the Caucasus were published in 1889-1890. Upon his return to France, the Ministry of Public Education entrusted him with his first official mission to Persia, where he did geological and archaeological investigations in the regions of Kurdistan and Luristan. He also made some minor discoveries in the high mound known as the “citadel” in Susa (Šūš), in the historical region of Susiana (the old Elam). This would lead him to reopen the excavations at the site, which would happen years later. 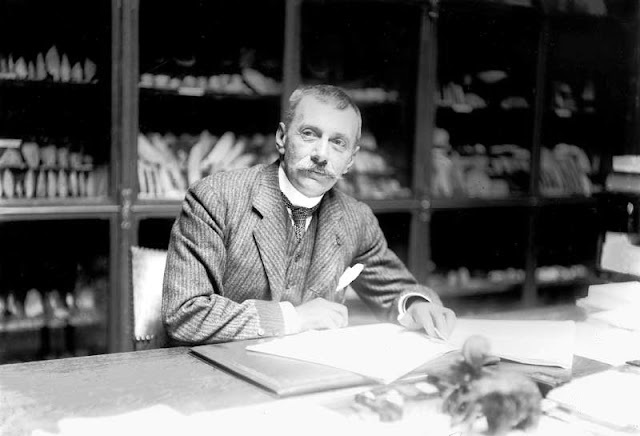 In late 1891 he was invited to take over as acting director of the Egyptian antiquities service; he remained in this interim appointment until 1897. He founded, with Giuseppe Botti, the museum of Greco-Roman antiquities at Alexandria; saved the temple of Kom Ombo from destruction; undertook publication of a general catalogue of the monuments and inscriptions of ancient Egypt; and, just before his departure, laid the cornerstone for the Cairo museum of ancient Egyptian antiquities. His explorations have allowed him to be considered the father of prehistoric archaeology in Egypt. He devoted himself to excavations there for the next ten years, although his decision to simply removing an enormous amount of dirt condemned the architectural remains of Susa to total destruction. In the meantime, he published his Mission scientifique en Perse (1894-1905) in ten volumes, with geological, archeological, geographical, and linguistic studies. In 1912 he also published the final excavation report on Susa. De Morgan also worked throughout the war, thanks to the efforts of Armenian writer and journalist Arshag Tchobanian, on a history of the Armenian people from its origins to his days. Published at the end of the war (1919) as Histoire du peuple arménien, it was, for a long time, one of the best available sources for the general reader. An English translation appeared in 1965 by the efforts of Hairenik Press, in Boston (History of the Armenian People: From the Remotest Times to the Present Day, translated by Ernest F. Barry). Fighting against health and economic problems for the last fifteen years of his life, Jacques de Morgan passed away on June 14, 1924 in Marseilles. His major works remain L’humanité préhistorique (The Prehistoric Humanity, 1921), and especially the three-volume La préhistoire orientale (The Oriental Prehistory, 1925-27), which appeared posthumously.